At the tender age of 27, Australian artist Frank Candiloro has a vision of what comic books are as well as what they can be, and, in his very distinct manner, he is slowly exploring these ideas. Blood Across Broadway is the latest offering from Candiloro's Franken Comics imprint. 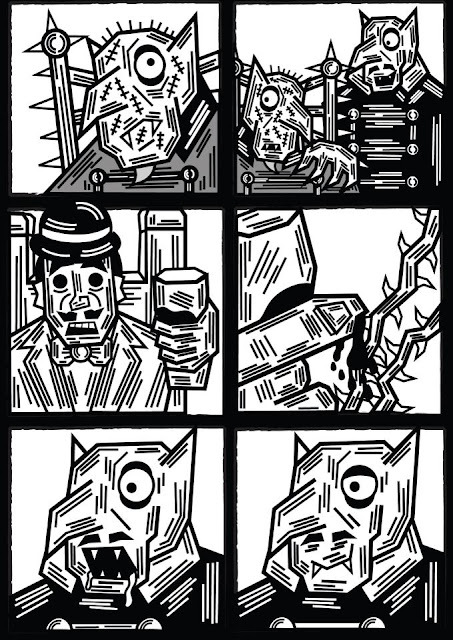 Like TheWidowmaker before it, this 70 page comic (graphic novel?) 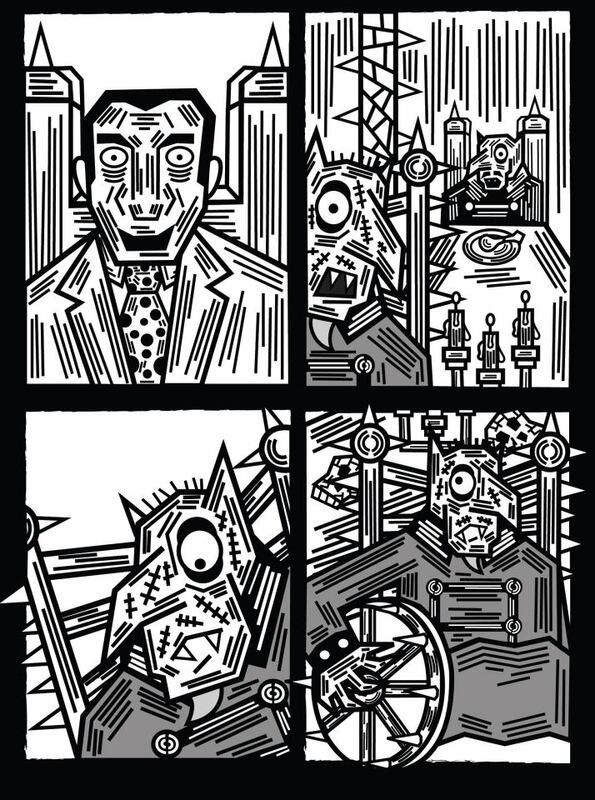 features Candiloro's signature black and white “German Expressionism, wood-block print, indy wonk vibe” style art, but in this book he is able to work in new layers of subtly and emotion that show an artist really coming into his own. The plot of this book treads some familiar ground, but while this ground may be familiar, it is from three different warring nations and is made into a mud-pie that tastes like ambrosia. 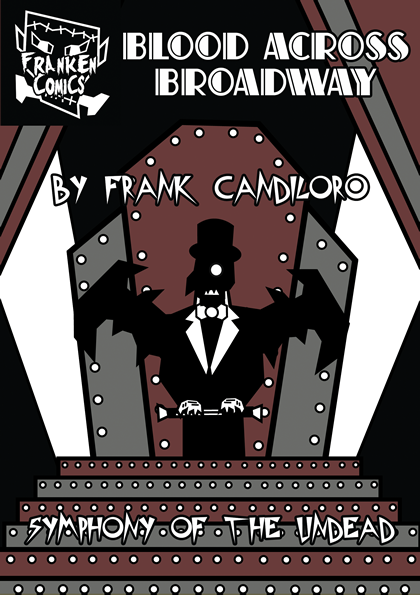 Candiloro advertises Blood Across Broadway as an “homage to Nosferatu, The Jazz Singer, and the most prominent Broadway musicals.” These are not things that you would normally think of as being part of the same comic book, let alone the same sentence, but in this book they work deliciously together. Set in the Golden Age of Hollywood and Theatre, the story features an old, crippled vampire known as Morlook, who fosters a tremendous love of jazz, theatre and dancing, much to the disapproval of his overbearing son Cartorius. 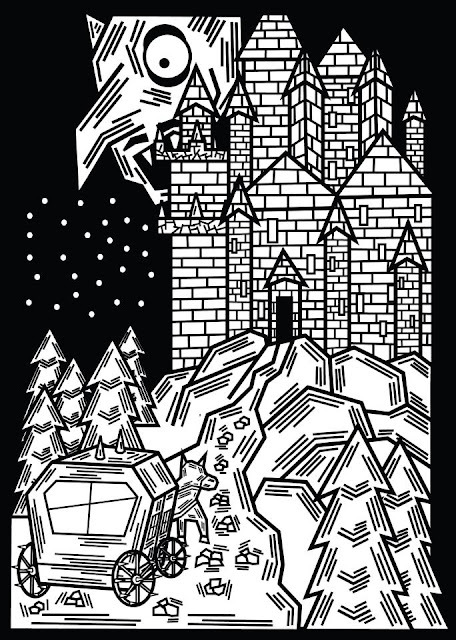 But with the help of a certain legendary dancer, Morlook learns the art of dancing and showmanship, all the while dreaming of being among the bright lights of Broadway, an unlikely setting for an undead creature of the night. Blood Across Broadway is creepy, it's funny, it's sweet, it's mean, and it's weird. Quite frankly, it's a Candiloro comic book. The ending was slightly confusing upon first reading, and the font he chose for the lettering can be a little hard on the eyes at times. Still, there is a lot to be praised in the simplicity of Candiloro's presentation. By compressing the story as he does, he allows the reader to expand upon every panel, character, and bit of dialogue he gives us, and in the process experience a story that goes well beyond the 70 pages that Candiloro has illustrated. Candiloro is a unique artist and storyteller. His books reflect his talent in both of these arenas. Blood Across Broadway is a further step in his development, and he's obviously wearing some fine boots on this journey. Blood Across Broadway can be purchased here.